Where Can I Buy Natural Gold Nuggets? 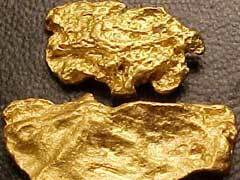 If you are looking for natural gold nuggets then you may wonder where to find them. Nuggets are chunks of gold that come in various shapes, sizes and weights. Very often these contain fragments of quartz and other materials. If you are a beginner, knowing that majority of nuggets come in 20-22K composition is helpful. Sometimes a unique shape of a certain piece can bring it additional value going beyond the actual precious metal content. Australia and Alaska are hands down the most frequent places miners find these rare specimen. Specialists attribute this to climate and precipitation variations in these areas. Whether you are looking for Australian Gold Nuggets or pieces from another country, finding them does not have to be difficult. You can visit a local dealer, go through the advertisements in your local newspaper or yellow pages, or you can use an online seller of natural gold nuggets instead. If you are going to choose an online seller then make sure you know the exact specifications of the gold you are buying, and this should be listed or stated. Further more the online places are preferred because you can research seller’s reputation, read customers’ feedback and can be supplied by a professional assaying certificate from a well known source. Natural gold nuggets can be found from auction websites including EBay, but use caution because some of these dealers may be very unscrupulous or unethical. Make sure that any photos show the size of the natural gold nugget against a ruler for the best detail. Some sellers may try to take a photo and greatly enlarge it, but these pictures will not include a ruler for reference and are easy to spot. Also make sure that if you use an auction site that the seller is trusted, and lists an accurate gold price per ounce. Some sellers will try to sell a twenty eight gram piece as an ounce, but gold should be measured in troy ounces, which have more grams. When you buy natural gold nuggets you are investing in gold that you can hold and admire. It is not hard to find these treasures, but you do have to use care and caution so that you do not end up paying more than necessary, or receiving fake products instead. An investment in gold is a very popular option, and has been through the centuries, and natural gold nuggets are a great investment to have. Buying these nuggets is not difficult to do, but you do need to do the proper research and evaluate many sellers before you finally choose one to buy from.